We are all familiar with thinking about the environmental and health aspects of traffic – congestion, pollution, greenhouse gas emissions, noise, accidents, physical inactivity – but what about the economics, the actual costs of these things in pounds? And how do these negative impacts affect Gosforth High Street, as these are the issues that the soon-to-be-announced proposals for the High Street need to fix? In 2009 the UK government calculated the negative impact of transport on the UK economy to be between £38.1 and £48.7 billion each year. With price inflation, growth in traffic volumes and a better understanding of the damage caused by pollution, the cost for 2016 could be much higher still. 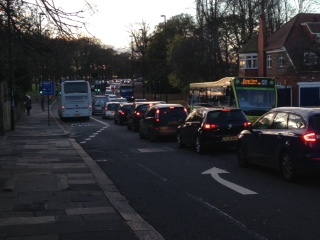 Congestion might be less of a concern than preventing accidents or the health impacts of pollution, but no-one can deny that it affects Gosforth High Street. You can see this most mornings and afternoons throughout the year. The traditional response to congestion has been to increase road capacity, for example by adding extra road lanes. In theory, more capacity should lead to a greater throughput and less waiting, but in practice the extra capacity attracts more traffic in an effect called induced traffic. This negates a large part of the expected benefit while also creating more pollution and traffic danger. This analysis suggests that life goes on – congestion does not get worse. As a result the whole area benefits from better air quality and safer streets. Any calculation of the cost of road casualties assume that the value of life and health can be quantified, and that deaths and/or injuries should be accepted in order to facilitate the movement of traffic. This need not be so. “Human life and health are paramount and take priority over mobility and other objectives of the road traffic system“. SPACE for Gosforth would like to see this principle applied to Gosforth High Street. 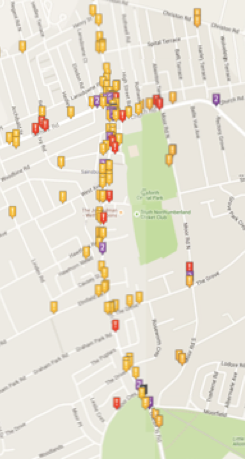 This map from www.crashmap.co.uk shows road traffic crashes on and around Gosforth High Street from 2005 to 2014. Only crashes reported to the police which have one or more recorded casualties are shown. Orange tags denote slight injuries, red tags are for serious injuries and the black tag shows a fatality. Purple tags show clusters where there have been multiple crashes. Clearly Gosforth High Street does not meet Vision Zero standards. Vision Zero also assumes that mistakes are inevitable, so roads should be designed to minimise injury to the people that use them, rather than relying on road users to always avoid mistakes. In Gosforth, “road users” could include a middle school pupil having to cross a busy road on the way to school, or an 11-year old on a bicycle (as UK law requires 11 year-olds to ride on the road). providing separation on faster roads, roads with a high volume of traffic, or roads used by larger vehicles such as buses or lorries. Separation in this context might include protected cycle lanes or signalised pedestrian crossings. See also the SPACE for Gosforth posts 20 mph – the right speed for Gosforth’s children and Lots of children want to cycle to school, but hardly any do. 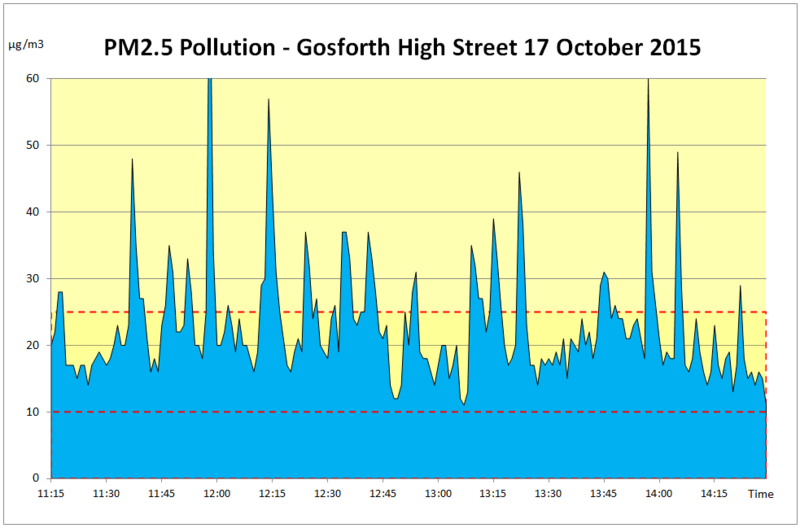 The reading cited in that report (15 µg/m3) is less than the average reading for our monitoring on Gosforth High Street: that was 23 micrograms per cubic meter. 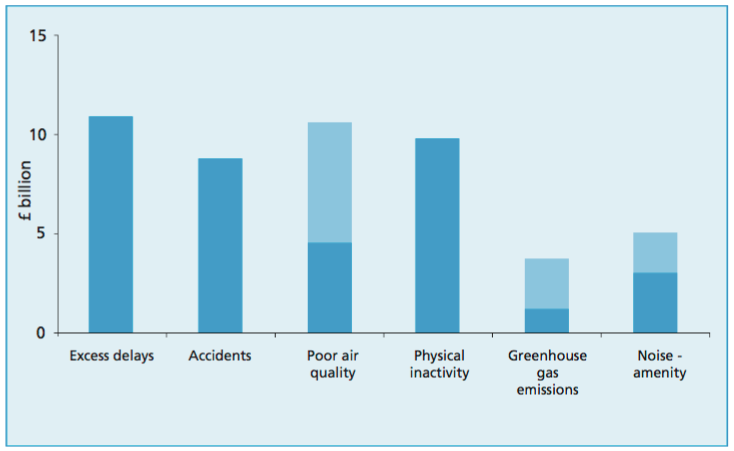 Other health effects of pollution are widely documented, including in this SPACE for Gosforth post. We listed ways to reduce pollution in our article Fixing Pollution on Gosforth High Street, including encouraging the use of public transport or walking or cycling. According to the report Turning the Tide of Inactivity by UK Active over a quarter of Newcastle residents are classed as inactive – doing less than 30 minutes of moderate physical activity per week. Activities could include walking, cycling, playing sport, gardening or dancing. The consequence of this inactivity is reported to be 279 premature deaths and a cost of £16.8m each year for Newcastle alone. Making our streets safer for walking and cycling helps people be active in their every-day lives. Even a short walk to buy a pint of milk could make a big difference to someone’s health. 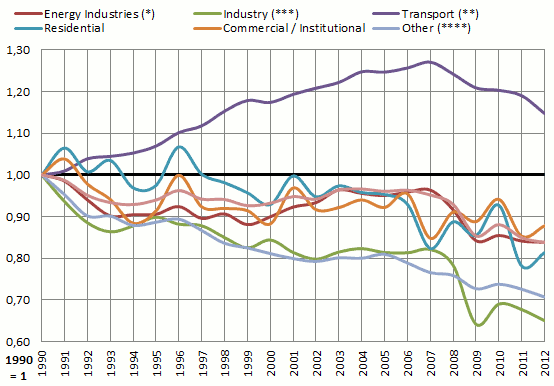 We don’t have figures from Gosforth High Street but this graph shows the Europe-wide change in transport-related emissions since 1990. Not all journeys can be made using public transport or on foot or by bike, but at present many people are deterred from walking and cycling because they do not find it safe or pleasant. Making it easier and safer to do so will allow people to make choices that suit their lifestyle. That will also help reduce greenhouse gas emissions. 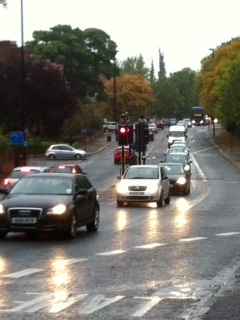 Gosforth High Street is undoubtedly noisy. We discovered this when we spent a Saturday morning measuring pollution levels, and talked to shoppers over the sound of the traffic. We don’t have any measurements but we do know the effects can be far more serious than you might expect. If you own or have access to a noise monitor we would love to hear from you! These are improvements we all want. The proposed changes to Gosforth High Street are a once in a generation chance to make this happen in Gosforth, and a strong response from residents is important to ensure that the proposed plans will minimise these issues. To find out more, get involved and be kept up to date on issues and initiatives in Gosforth you can join SPACE for Gosforth here. I live near Ashburton Road in Gosforth. Sometimes when I open the front door in the evening to put the milk bottles out, I can actually smell chemicals in the air, a sort of horrible acrid smell. It is particularly noticeable if there is low cloud. It may be that I have a particularly good sense of smell because other people I have spoken to don’t seem to be aware of it. It’s quite worrying to think there is this invisible pollution in the upper atmosphere. 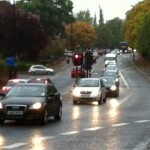 How much is Gosforth affected by say Gateshead industries and car use blowing over here? I had never thought about it before! Extract from a study on the effects of transport noise 21 July 2017. Sonic doom: how noise pollution kills thousands each year.